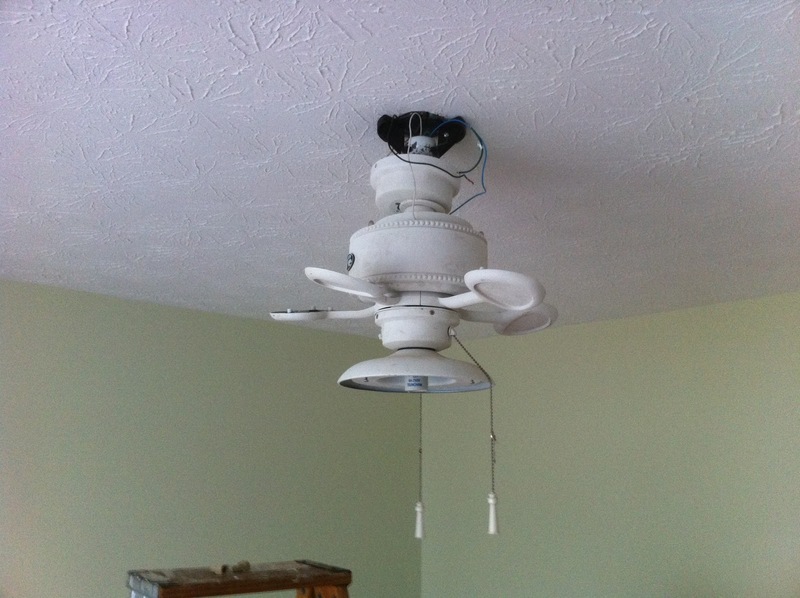 Fan Installation for the DIY’er! Jacque and I frequent the Habitat for Humanity Restore here in Knoxville. 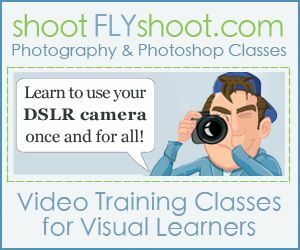 It’s a great place to find “treasures” that just need a little love! On one of our recent trips to the Restore, we happened on a fan with a light kit that coincidentally matched the one we have hanging in our guest room. 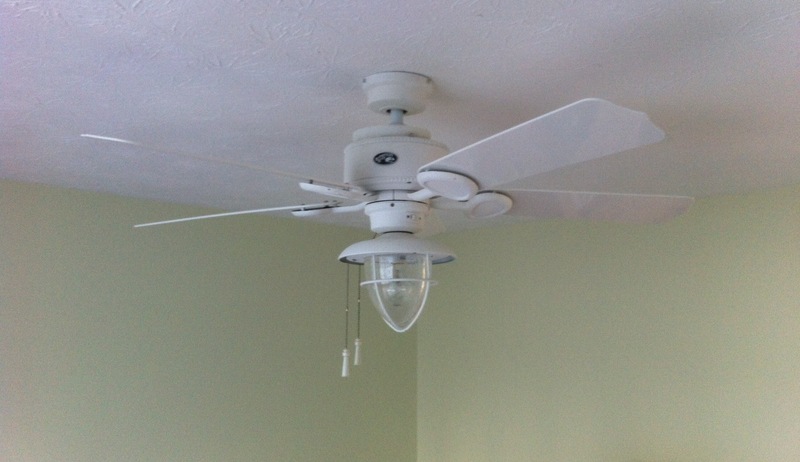 The fan needed fan blades, but for $15 we couldn’t pass up a fixture that matched one we already had! In hopes to help out anyone who is new to hanging fixtures, here’s a tutorial on how to hang a fan. When I removed the fixture, I found that the existing box wasn’t strong enough to support the weight of a ceiling fan, so I went to the local hardware store and purchased a fan brace support that was really easy to install. 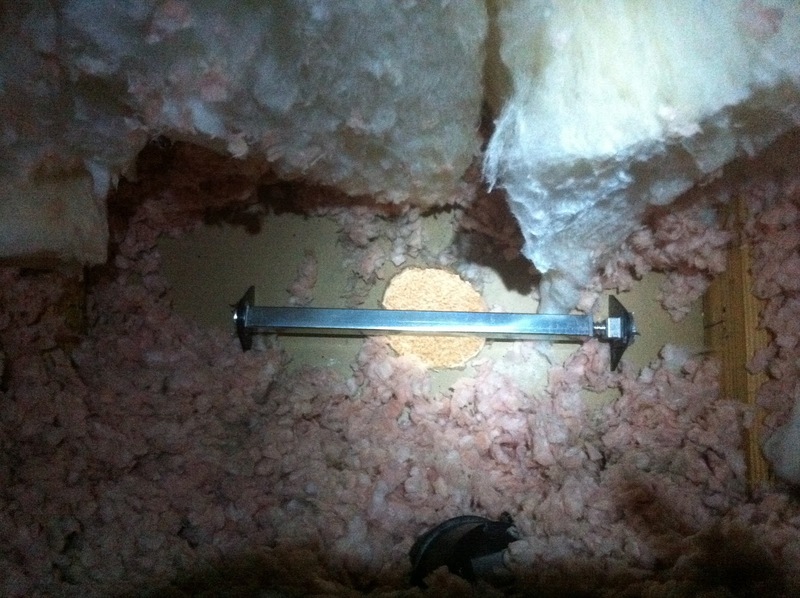 I went into the attic and moved aside the insulation to gain access to the existing hole in the ceiling. The brace is easily adjustable and after reading the instructions, I was able to secure the brace in place and move onto the next step. The Brace support comes with a fan box that is easily attached to the brace. It’s important to remove one of the “knockouts” on the top side of the box as to have access to the existing wire. A “U” bracket fits over top of the brace and the box attaches to it with a few nuts and bolts. The next step is to attach a mounting bracket to the fan box using the included screws. The mounting bracket acts as a cradle for the fans mounting ball. Here’s the fan hanging on the mounting bracket without replacement blades. To make installation less awkward, I recommend waiting until the fan is wired and hung before adding the new fan blades. 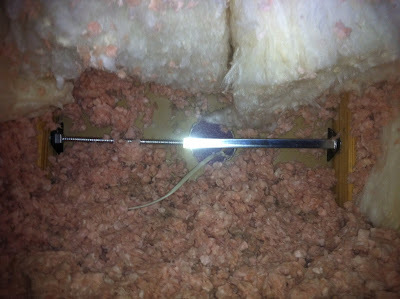 In this position, you’ll have easy access to the wiring for completing the installation. 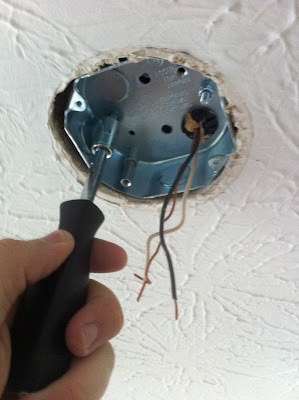 Since I’m not a licensed electrician my recommendation for the next step is to follow the manufacture’s instructions for wiring in the new fixture. Most fans will will have a collar that slides up flush to the ceiling to hide the mounting bracket and the wiring. 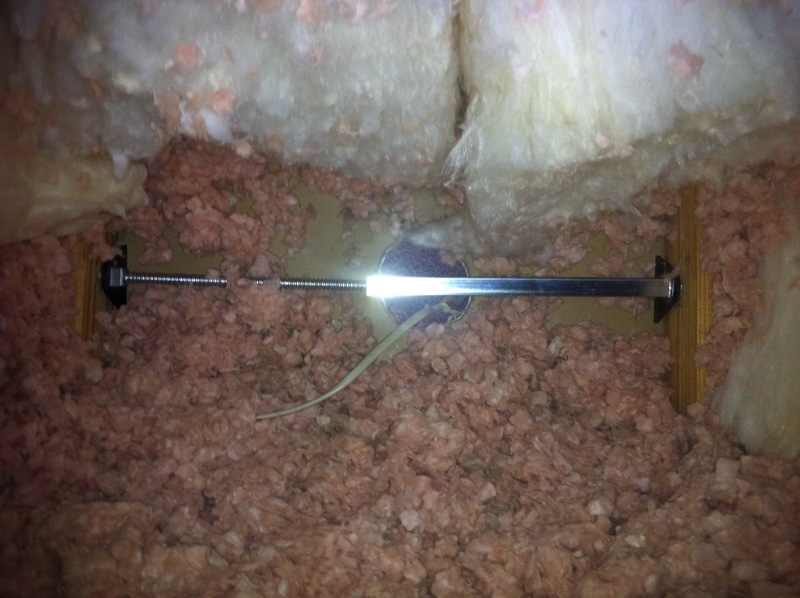 These collars are normally secured in place with screws that attach to the mounting bracket. Once the fan installation is complete it’s time to turn the power back on and enjoy your newly installed fan. So don’t let the idea of installing a new fixture intimidate you! And don’t forget, if you’re looking for a new fixture for your house, stop by the nearest Habitat for Humanity Restore and see if they have what you’re looking for! 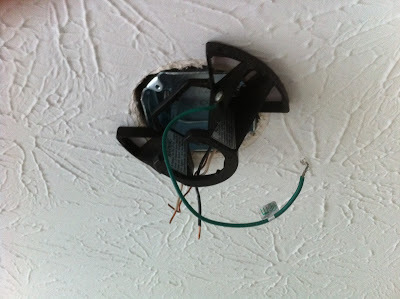 Always make sure to check the wiring in the “new” fixture as well. 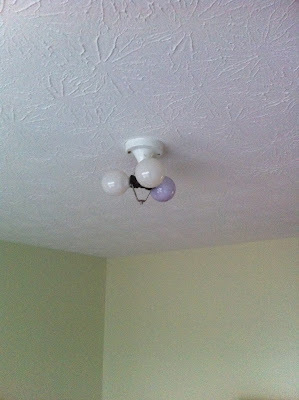 We found that although the light fixture looked almost new, the wiring was very brittle and could very well have caused a fire. We had to do away with the fixture after all that searching for one.